Culverts, basins, drainage boxes: these are the utilitarian civil engineering components that perform the very critical environmental task of slowing and filtering storm water runoff. However, they don’t always look that great. For tight sites, or projects with certain aesthetic goals, these storm water measures are sometimes hidden underground entirely, at no small cost. 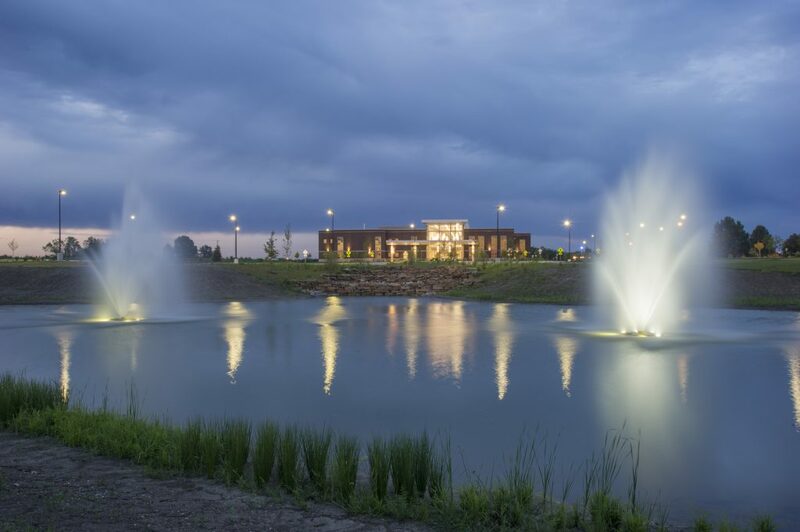 The University of Missouri’s South Providence Medical Building took a different approach to storm water management. What looks like a landscaped pond with fountains and a waterfall on the site’s busy street corner is really a series of rain gardens, bioswales and retention basins that slow the rainwater coming from the building’s roof and parking lot. Surrounding the basins is a walking trail open to the public. What was an environmental necessity is now also an amenity for staff and visitors. The Hawthorn Bank Trust & Operations Center and Capital Region Medical Center were designed so that their multipurpose meeting spaces could be accessible to outside groups after hours, without disrupting the security of the rest of the building. At OHM Professional Offices the concrete block restroom core is also a tornado shelter and the platform for a mechanical equipment mezzanine. All buildings need a roof, but at the Walnut Professional Building, a portion of the roof was designed to be occupiable, creating an attractive and unique space that can be leased at a premium.